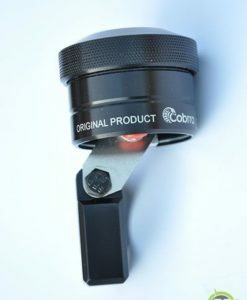 The Cobrra Nemo 2 is an automatic motorcycle chain oiler designed to extend the life of your chain and sprockets up to 7 times longer than normal. This chain lubrication system is very robust yet simple to fit and operate, providing years of trouble free service. Suitable also for rugged off road use as it has no moving parts due to being machined from a solid block of aircraft grade aluminium. 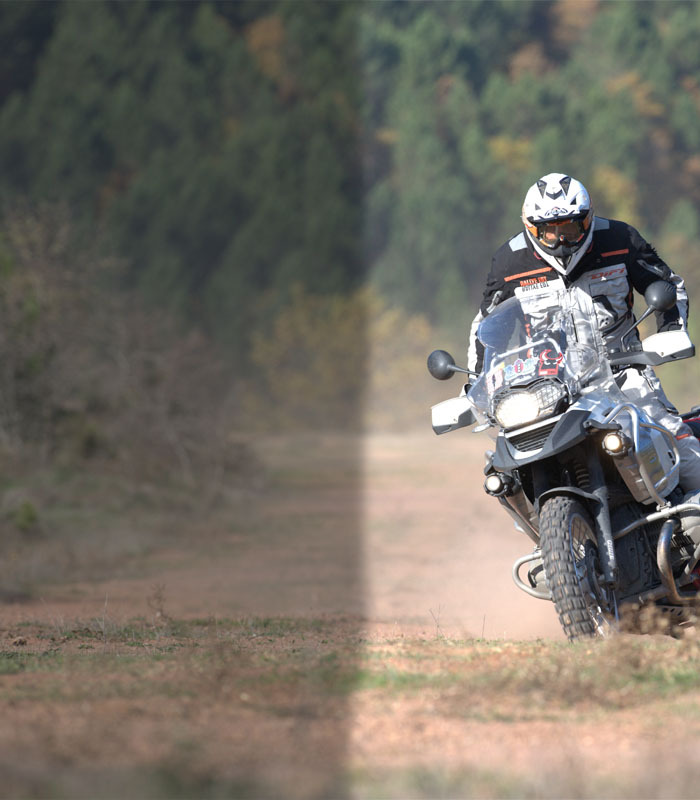 The Nemo 2 has a patented compression oil drive system which allows for the use of varying grades of oils from motor oil through to viscous gear box oil, ideal if you are travelling in remote areas with limited oil options. No other chain oiler can operate with such a wide range of oil viscosities,  saving money and effort by dispensing with the need for expensive chain lubricants or having to place your bike on a center stand every time you need to lubricate your chain. Keep your chain and sprockets working at maximum efficiency, reduce wear and extend the life of your chain and sprockets by providing a slow and continuous flow of oil when you need it: direct from your handlebars. No mess, no fuss. Cost effective, simple and reliable, every time. What makes the Cobrra different to other brands of chain oilers? Vacuum driven: This system utilizes pressure from the bike’s vacuum to deliver oil to the chain and requires cutting and plumbing into the bike’s vacuum system, something a lot of riders are hesitant to do as it could void aspects of the bikes warranty. Vacuum based systems also have reliability issues. Electrical: Such derivatives use electrical power to drive a pump which, in turn, forces oil to the chain. 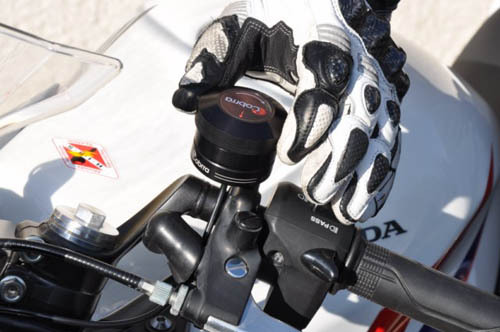 Installation requires tapping into the bike’s electrical system and when in operation places an additional load on the bike’s charging resources. Such pumps also have a finite life span. Gravity fed systems: Such lubricators are the simplest but also prone to the most instances of malfunction due to changes in ambient temperatures and oil viscosity. To get oil to flow, riders often have to change the oil to match the prevailing ambient temperature, otherwise the oil will simply not flow. The Cobrra Nemo 2 works on the principle of compression. Oil is displaced under pressure via three mutually interconnected work chambers housed in a machined aluminium reservoir. This patented system ensures that it works reliably in warm and in cold weather. You can be rest assured that oil will be fed ensuring adequate chain lubrication every time with no need for vacuum or electrical power to operate. A simple 90 degree turn of the handlebar dispenser will deliver oil to your chain for 3 minutes which is enough for more than 350 km of riding. Need more oil? Simply turn another 90 degrees. A full oil dispenser can lubricate your chain for over 5000 km . Refilling is a simple exercise with virtually any motor oil. All components required are supplied . Installation is a simple task. The main dispenser unit connects to your handlebar mirror stem mount. An oil feed line is routed to your rear sprocket . No cutting or altering of the bike’s wiring or vacuum is needed. 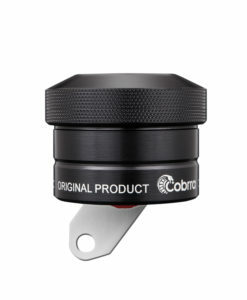 Should you wish to place the Cobrra oil dispenser closer to the sprocket (e.g. 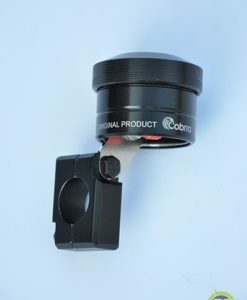 frame) an optional an 22mm clamp is available. Chain wear can dramatically affect riding safety with many riders overlooking this vital component. A bike chain is the final drive element, the last thing that transfers power from the engine to the rear wheel. If it fails, there’s no incoming power to the wheel and sudden loss of thrust is a very serious hazard. Imagine going through a turn and as you lean and twist the throttle you find you have no thrust or response? Ditto for a broken chain when overtaking. More so if the chain wraps around your bike or you when it snaps. Or if a chain jumps off the sprocket? This can not only cause injury to a rider but serious damage to the bike if the chain wraps up behind your front sprocket or jams elsewhere, effectively locking your back wheel. It is important therefore to regularly lubricate your chain and check that it is tensioned correctly. The goods news is that chains do not simply fail . There are plenty of tell signs to warn you in advance if you know what to look for. 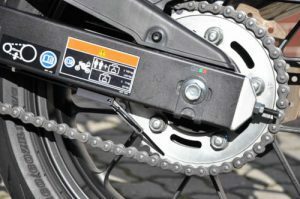 Motorcycle chains are broken down by a number of simple criteria: width, length, and roller-support lubrication design. Standard widths are 520 and 530. Standard lengths are counted by the number of links in the chain -110/112/114/116/118/120 are standard link counts, while you can obtain chains up to 140 links from most manufacturers. Chains are made by linking rollers together using pins and side plates. In essence, metal against metal and, in the absence of lubrication, metal rubbing on metal will generate heat and degradation. Initially chains were simply open-ended roller bearings that required a lot of lubrication to keep them from wearing too fast (usually by immersing them in oil every several hundred km). 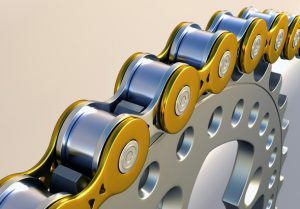 Newer chains employ a lubricant inside the chain roller mechanism which relies on rubber sealant rings between the side plates to prevent this lubricant from oozing out. Such chains are categorized by the shape of the rubber ring. The most typical sealant is ring shaped like a big “O” and such chains are called O-ring chains. Alternatively, some manufacturers have designed sealant rings shaped like an “X”, a “W”, a “Z” and a variety of other shapes to help promote a long seal life. The lubrication retained via these seals however will not last forever and will start to run low, regardless of which type of sealant ring is employed . Re-lubrication is, therefore, a must and should be part of your maintenance and safety regime. The primary causes of chain failure are lack of lubrication and chain elongation. The importance of proper lubrication and maintenance of a bike chain cannot be overstated. Loss of sealant ring integrity is sited as the number one cause for chains to fail. The primary way to keep this kind of failure from occurring is to keep the chain (and thus the rings) free of sand, dirt and other contaminants via regular cleaning, and as important, keep them well lubricated . Regular lubrication will reduce friction wear, prevent the rings from drying out and produce secondary benefits such cushioning impact loads and aiding heat dissipation. Contrary to popular belief, chains do not stretch. The outside measurement of an individual link plate does not get longer with wear. Your bike is not so powerful that is stretches the chain. Chains are constructed of essentially link plates, pins, bushings and rollers. In order for a chain to roll around a sprocket, the pins must have clearance through the bushing holes, allowing them to pivot. The pins and bushings are subjected to continual pivoting and, as they pass a sprocket, steel against steel wear occurs. 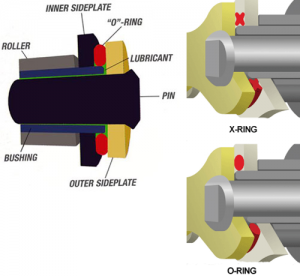 This causes the pins and their mating holes to wear in an eccentric manner as the diagram below shows. In abrasive dirt conditions and especially mud, grains of sand are introduced between these mating surfaces and wear is accelerated many times over. A sealed chain (O-ring, X-ring, Z-ring etc) acts to prevent abrasives but still requires re lubrication from time to time. Place the bike on its center stand (or hold upright) with no load. Pull the chain back at the outer most point of the sprocket. The tips of the sprocket teeth must remain inside the chain links. 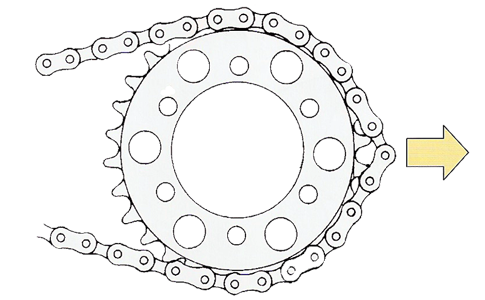 If the chain can be pulled back far enough to expose the tips of the sprocket teeth, either re-tension the chain or replace it. It is accepted practice to replace the chain front and rear sprockets at the same time. 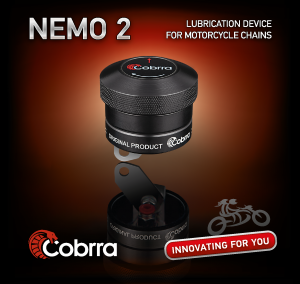 Cobra Nemo 2 Chain Oiler: automatic motorcycle chain oiler designed to extend the life of your chain and sprockets. 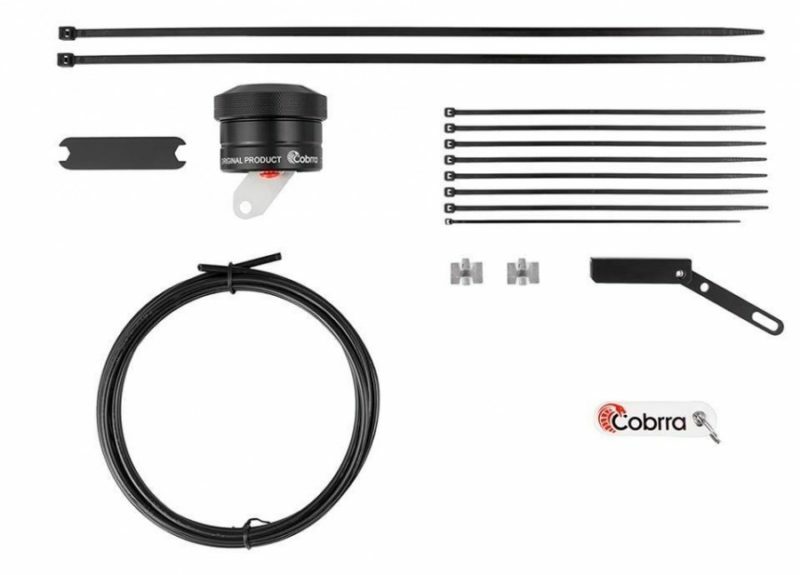 This universal mount allows you to mount the Cobra Nemo to your 22 mm Handlebar in different permutations.